After graduation, Advertising alumnus Casey Hurbis ‘93 hit the pavement to deliver dozens of resumes to prospective employers, eventually landing an unpaid internship at a small Detroit agency. Today, he is the chief marketing officer (CMO) of Quicken Loans. A few months into his first job, Hurbis was offered a position at another agency, where he began as an intern earning $5 an hour, and was later promoted to a full-time role as a traffic coordinator. He was responsible for sending voice-overs, tapes and instructions to TV and radio stations across more than 200 regions. Hurbis’ first big break came at the global agency BBDO, where he spent the next 17 years managing accounts, regions and large teams for the Chrysler Jeep Dodge Ram Dealer Advertising Associations. At age 27, he became a vice president at the company. In 2011, Hurbis was recruited by a client to join the corporate marketing side at Fiat Chrysler Automobiles (FCA). He became the head of brand communications for North America just as the Italian-born brand was relaunching in the U.S. after a 28-year hiatus. 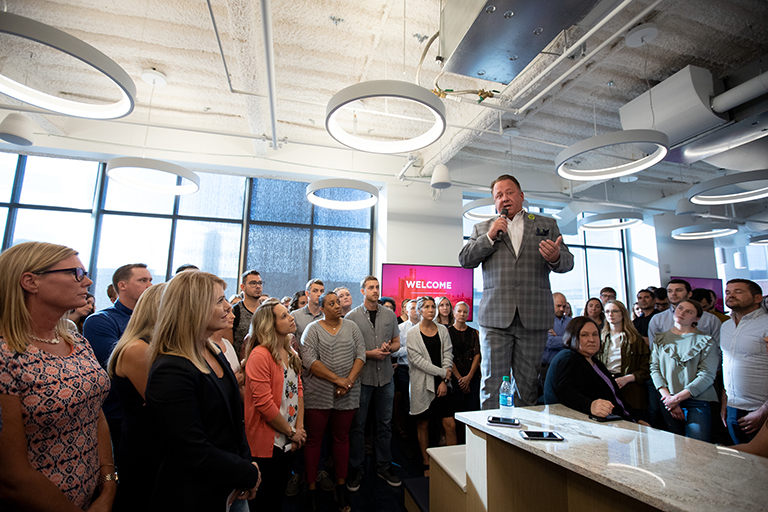 During his seven-year run at FCA, Hurbis and his team launched five vehicles in the U.S., built up the FIAT dealer network, made three Super Bowl commercials and won several advertising awards. Last year, Hurbis reached new heights in his career, joining the executive suite at Quicken Loans as the CMO. He leads their in-house agency team of more than 200 and oversees the creative execution on everything from the Super Bowl to t-shirts for the Rocket Mortgage brand. Collectively, they produce over 13,000 assets and over 1,200 videos a year. When he’s not in meetings and creative reviews, he tries to find time to walk the floor and talk one-on-one with his team members. Hurbis was born and raised in Metro Detroit. When he was in high school, he was warned not to go downtown. Now, he’s excited to see the city transform and to be part of an organization that is spearheading the revival. Hurbis speaking to Quicken Loans staff. While at MSU, Hurbis played water polo all four years for the men’s club team and worked as a lifeguard at IM West and a volunteer coach at East Lansing High School. He and his fellow water polo team members also started the women’s water polo club team. As a student, Hurbis looks back on his capstone class, ADV 486: Integrated Campaigns, as the most impactful course of his college career. He was assigned to promote the new Chevrolet Cavalier for the local Lansing-area dealership. Hurbis will be attending the MSU Forbes CMO Symposium on Nov. 2, 2018 at the Wharton Center. He’s excited to share the stage with fellow CMOs and impart wisdom to ComArtSci students from “The World of Casey” — his name for the values he lives his life by.